The classic Dutch licorice. 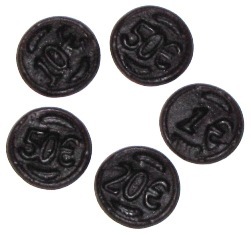 These harder, very chewy coins have recently changed to show euros instead of guilders, but the flavor is the same. If you love the flavor of these but can't have or don't want sugar - we have Sugar-free version that tastes almost the same but without sugar! This is the best licorice I have ever eaten! It is not easy ..